I have been really remiss in not blogging this. This was my birthday present from Wes. (I gave him the web address and told him exactly what to order.) It's a cherry Hansen MiniSpinner with a Woolee Winder. I love it. It hums along spinning away at an even speed. 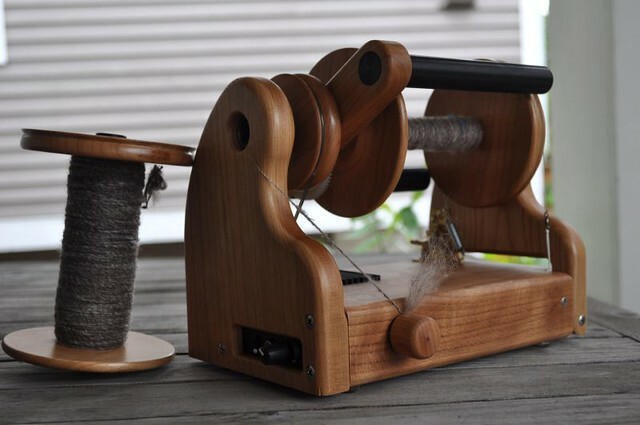 The Woolee Winder loads the bobbins so evenly my spinning looks just perfect there. It fits into a tiny tote bag that comes with it. I love taking it to spinning on first Fridays at The Fiber Gallery. So much easier than taking my Lendrum. But since we got George I put it away, worried that he or Isabella would get tangled in the cord and pull it off the table, or knock it off, or in some other way damage it. But tomorrow is the start of the Tour de Fleece and I'm on Team Footloose. My goal is simple, to spin. I will be away from my wheel for five days while I'm at camp. I just want to make a point to do some spinning every day I am home. I'll finish that suri alpaca/Bluefaced Lecicester I got from Toots le Blanc at Madrona that's on the bobbin. Then I'll dig out some other long-forgotten spinning project. Who else is doing Tour de Fleece? I'm in the tour too! A friend and I are doing a Fear Factor challenge as our Tour de Fleece. We'll be spinning all kinds of freaky fibres that intimidate us. I started with some mohair locks today. They're pretty fun to work with. I think it's going to be a fun month of learning new tricks. I have a brand new Lendrum myself. I'm in! I'm looking forward to getting a lot done this year. Goals are to spin everyday, worry about quality and have fun.